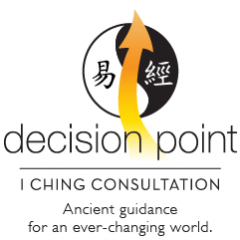 What do I need to know before consulting the I Ching? How can I increase my chances of attaining meaningful answers from the I Ching? When is it NOT appropriate to consult the I Ching? Mary Kay Landon, PhD, and a client discussing a reading. There are literally thousands of different readings contained in the I Ching, and they address every area of human life, from love to war, birth to decay, sublime success to abject failure. And it is this specificity that sets this oracle apart. When you consult the I Ching, you sometimes are literally told: “Go ahead.” Or “Stop.” Or “Watch out for hidden forces.” Or ”This isn’t the right time.” Unlike other oracles, the I Ching can be very focused; you won’t be presented with a vague set of archetypal images that seem only tangentially related to your situation, and from which multiple, even conflicting, meanings can be derived. So, to sum up, be prepared to receive any kind of response to your question, including a negative one. Should that occur, you can ask the I Ching how to avoid or mitigate the unfortunate situation. You can, however, ask for clarification on the first reading. Some of my most meaningful readings turned into “conversations” with the I Ching because the results of each reading would invoke another question. When you engage the I Ching at this level, you can gain a palpable sense that you are indeed conversing with an old Chinese sage. Incredible! Some people also choose to take a “weather reading” of their life by casting the I Ching without a specific question in mind. Although they maintain that this practice can yield meaningful readings, I don’t recommend it. One of the I Ching’s salient qualities is its specificity, so when you ask it to comment on your life in general, you could receive an obtuse reply, such as “Winds following one upon the other: The image of Gently Penetrating. Thus the superior man spreads his commands abroad and carries out his undertakings”. * Or you could receive a reading that seems ripped straight out of ancient Chinese war practice: “Perchance the army carries corpses in the wagon. Misfortune”. * The question you are then left with is: What does this refer to? Because you asked no good question, the I Ching will probably either give you a seemingly vague or irrelevant answer or it will specifically address some aspect of your life that you might be able to guess, or not. You can also attain incongruous readings if you fail to consciously ask the question that’s really on your mind. This gets to the importance of crafting the question (which is not always as easy as it sounds). If there’s a more fundamental, i.e., more meaningful question behind the question you are asking, it’s possible the I Ching will give an incongruent reply to your stated question because it is really responding to the unstated question. For example, if you ask about the wisdom of starting a business but are really concerned about how you are going to repay the $10,000 you borrowed from your uncle, your I Ching reading might address that latter question first. In addition to trivial questions or those that seek to test or cajole the oracle, there are other types of questions that may not yield the most meaningful readings. Questions involving long time frames. The I Ching is the “Book of Changes” for a reason. One of its enduring tenets is that the world — comprised of heaven, earth, and humanity — is a dynamic system involving (at its core) the interplay of yin and yang that is perpetually engaged in change. Of course we see the forces of change at work in world politics, in business, in our communities, and in our own lives. Because many known and unknown factors influence these changes, the future state of any given situation is not predetermined and, therefore, an I Ching reading acquired right now for a situation due to mature, say, in a year may not be accurate because other influencing factors will intervene in the meantime. For this reason, while I do recommend assigning a time frame to a question posed to the I Ching, I don’t recommend trying to prognosticate an outcome beyond three months. However, if you want to know your prospects for successfully completing a project that will unfold over months (or even years), you can periodically ask the I Ching questions about incremental progress over time, or wisest approach toward the entire project. That all said, if a project or relationship — even a long-term project or relationship — is actually doomed from the start, the I Ching will give you that feedback, as it did regarding my future relationship with an employee in the example on the “Home” page. Because the I Ching is a complex system, it supplies far more nuance and information in its responses than “thumbs-up” or “thumbs-down.” The style and content of its responses can thus complicate interpretation of seemingly simple questions, especially for people who are unfamiliar with the I Ching. However, I understand that sometimes you really need a “yes” or “no” response to a burning question, which is why I can help you reframe the question, or break it into several questions to drill down to the heart of your inquiry. Situations where the answer is evident. If something is a foregone conclusion, don’t ask the I Ching about it. As discussed above, such a question is really more of a disrespectful test of the I Ching than a sincere query. As such, the I Ching may comment on your motivations for asking about the obvious rather than supply the affirmation you are looking for. Of course if there is still some uncertainty, divination is appropriate. Situations where you don’t want to know the answer. Many people turn down my offer to consult the I Ching on their behalf because they feel superstitious that maybe divining will somehow meddle with the outcome. Though impossible to prove empirically, this theory might have some merit. In divining about a situation, you are introducing a factor of inquiry that just might tip the balance one direction or another. Also, sometimes people feel it’s more fun or interesting or respectful of a future state to let it unfold without examination. While you can consult the I Ching about public events that are beyond your personal sphere of control or concern, you shouldn’t use its responses as a basis for gambling. The I Ching is not an ethics-neutral system, but rather a philosophical one that is grounded in literally thousands of years of practice and reflection. As a result, it does have some biases. While you might experience some success using the I Ching this way (especially if you come from a position of sincere financial need rather than unvarnished greed), you will probably ultimately discover that the I Ching will begin commenting on your motivations or supplying incoherent replies to such questions.